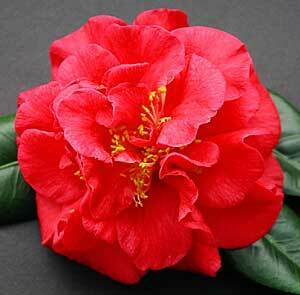 Members of this species and their hybrids provide blooms of glamour and magnificence not seen in any other flower. The flowering period of the group extends, in Sydney, from early May to the end of September and established trees of most varieties produce blooms for two months. Size of average blooms which may be expected is indicated in the following descrioptions and even larger flowers will appear as plants mature. The blooms keep on expanding for several days after opening. Growers will find surprises and delights in store. The plants appreciate more sun and light than the average C. japonica and can fail if positioned in an over shaded or very windy spot. The one pronounced annual growth in the Spring is so strong on our plants that it can droop during the warmth of day, but this should not concern, providing the plant is not overexposed to sun or wind. Do not over water at this time. Leaf chewers seem to delight in this young growth - spray with the appropriate insecticide to combat. Spring growth is often preceded or accompanied by unusually heavy, natural leaf fall. These plants require a light, well drained soil containing plenty of humus.